SCVHistory.com LW3421 | Film-Arts | William S. Hart is 'Wild Bill Hickok' (1923): Publicity Still No. 619-79. In his third-to-last film, William S. Hart (second from left, seated) plays the title character in "Wild Bill Hickok" (1923) from Famous Players-Lasky, distributed by Paramount-Artcraft. It was filmed at the Lasky studio and on location in Victorville, which doubled for Dodge City. Original publicity still No. 619-79, 8x10 inches, linen backed. "Wild Bill Hickok" was the tipping point that led to the end of Hart's moving-picture career. Only a fragment of the film survives, so we can't judge it first-hand, but according to Hart biographer Ronald L. Davis (2003:174-76), it presents a dime-novel view of Hickok that is divorced from reality. "The mistakes in the movie were glaring," Davis writes, "all the more annoying since they came from a man who had built his reputation on presenting the old West authentically." It opened to mixed reviews. Josie Earp, wife of Hart's pal Wyatt Earp, who wanted the actor to portray him in picture because he'd been getting bad rap lately, told Hart she "saw it twice with several friends and each time the house was packed. When you appeared upon the screen the applause was wonderful." The Milwaukee Journal said: "Never has Bill Hart's trusty six-gun spoken so eloquently as in these scenes, nor the pinto pony performed more heroic service for his master." The New York Times was far less kind: "Nobody connected with this picture seems to have the vaguest notion of the chief character. Wild Bill did not strut around with his chest out. Nor did he pose as a hero. ... Mr. Hart is enthusiastic about his shooting and his sobbing. It is sad enough to witness the tearful grief of a big man, but it is agony to sit through Mr. Hart's weeping and shaking." Jesse Lasky at Paramount cut his losses. Audiences wanted an uplifting story that Hart didn't deliver. Hart was incensed. Lasky and Hart agreed one more picture would be his last for Paramount — "Singer Jim McKee," which, Davis writes, "may possibly be the worst film the cowboy star ever made" (pg. 180). The plot was incoherent, and Hart was too old to woo a damsel 30 years younger believably. After that, no studio seemed willing to take the risk — except for United Artists, which Hart had previously rebuffed. It put its brand on one more Hart picture, his biggest production ever. But "Tumbleweeds" didn't live up to expectations at the box office, leaving Hart ride off into the history books and shelter himself on a hilltop in Newhall — far enough away from the noise of Hollywood but not too far if the studio bosses ever woke up and regretted the error of their ways. Produced by Famous Players-Lasky; presented by Adolph Zukor; distributed by Paramount-Artcrarft; New York premiere November 18, 1923; released December 2, 1923; ©December 1, 1923; seven reels (6893 feet). Directed by Clifford S. Smith; screenplay by J. G. Hawks from a story by William S. Hart; photographed by Dwight Warren and Arthur Reeves. Print sources: MoMA; fragment included in The Saga of William S. Hart. 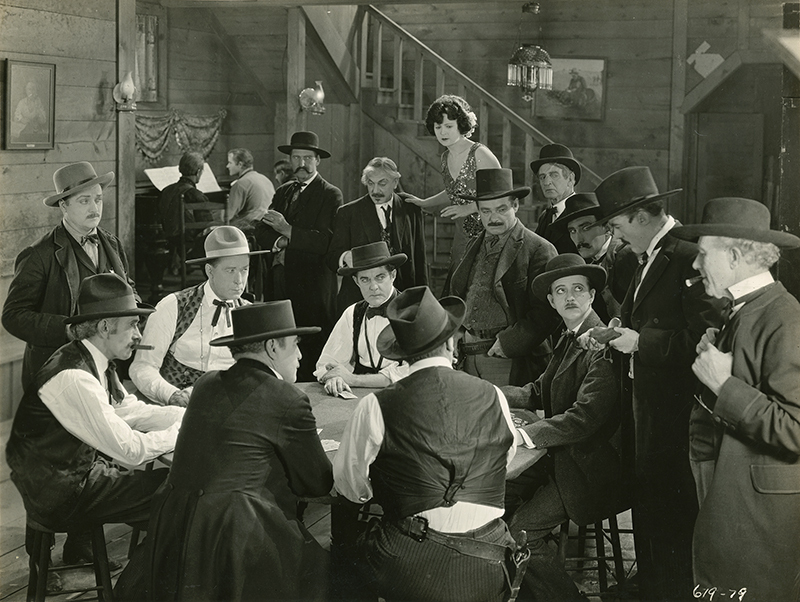 CAST: William S. Hart (Wild Bill Hickok); Ethel Grey Terry (Calamity Jane); Kathleen O'Connor (Elaine Hamilton); James Farley (Jack McQueen); Jack Gardner (Bat Masterson); Carl Gerard (Clayton Hamilton); William Dyer (Col. Horatio Higginbotham); Bertholde Sprotte (Bob Wright); Leo Willis (Joe McCord); Naida Carle (Fancy Kate); Herschel Mayall (A Gambler); Fritz (Paint). LW3421: 9600 dpi jpeg from original photograph purchased 2018 by Leon Worden.